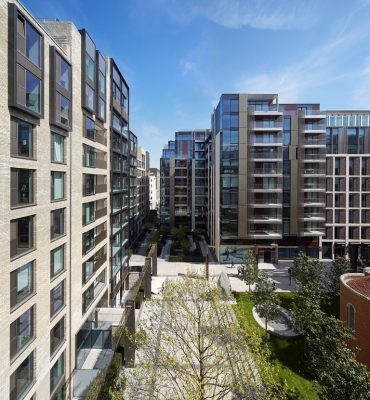 Fitzroy Place is a rare opportunity to redefine an urban block in the heart of London’s West End. Working with a predominantly cleared site left by the demolition and relocation of the Middlesex Hospital, Sheppard Robson and Lifschutz Davidson Sandilands have collaborated to deliver a thoroughly mixed use project, a complementary ‘family’ of buildings in an architectural vernacular that speaks distinctly of Fitzrovia. 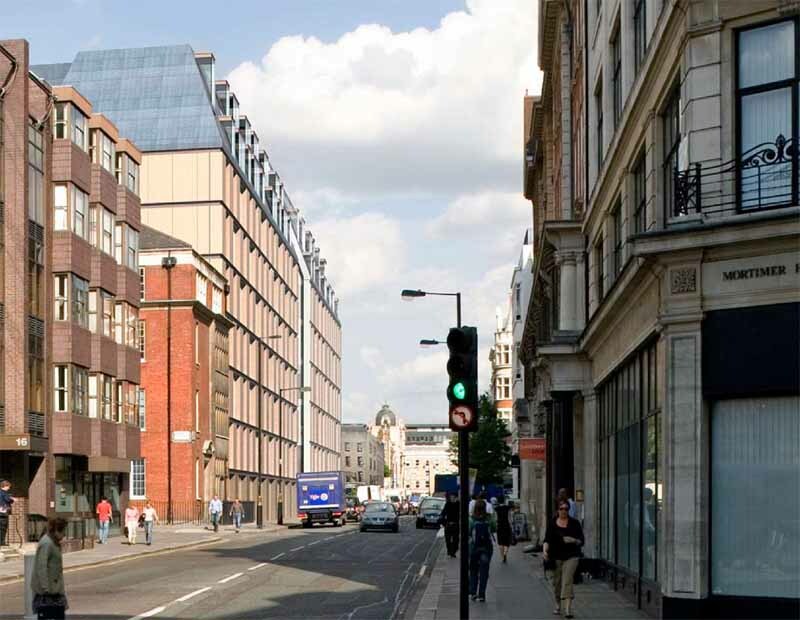 Fitzroy Place has 289 affordable and market homes, 220,000 sq ft NIA of offices, new shops, restaurants and community space, with these elements woven together and set around a new publicly accessible square. 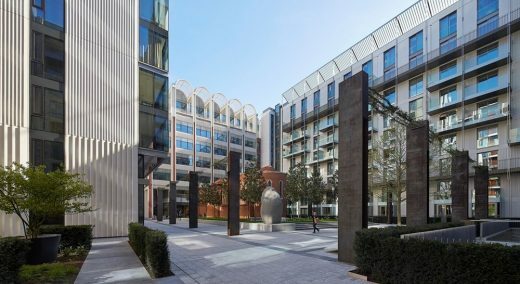 The public realm also works to formally frame the restored Grade II* listed Fitzrovia Chapel, creating a ‘quiet oasis’ just a few steps away from the energy and bustle of the surrounding area. The initial stage of work by Sheppard Robson established a strategy for two office buildings on Mortimer Street, with residential buildings arranged around the perimeter to form a central courtyard; this was designed to be a formal urban space and an appropriate setting for the listed chapel. Lifschutz Davidson Sandilands then elaborated on Sheppard Robson’s masterplan, tuning the design to respond to the context of Fitzrovia. The design draws on the distinctive identity of the surrounding urban fabric, respectful to nearby listed buildings and engaged with the materiality and quirky character of the area. Once the architectural vernacular had been established, Sheppard Robson and Lifschutz Davidson Sandilands set out to explore the idea a ‘family’ of buildings that was set out in the masterplan. The ambition was to create an agglomeration of distinctive buildings that are sensitive to the urban grain of the adjoining streets, with individual identity and character, but having an overall coherence. Working in collaboration, the team identified guiding design principles and a palette of materials based around white precast Portland concrete and a range of bricks that complement the variety of colours and textures found in the surrounding streets. 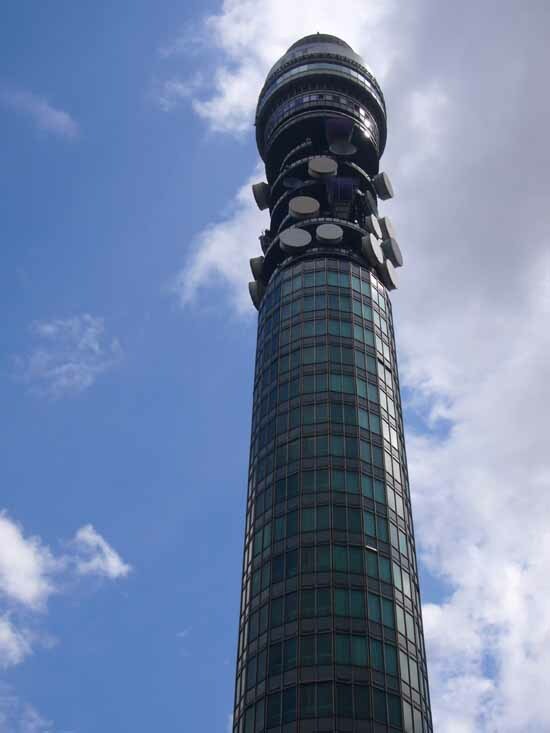 The aim was to create buildings that were clearly contemporary in character, but definitely ‘of ’ Fitzrovia. The main approach to the courtyard is from the south, from Mortimer Street, where an arcade, lined with a popular restaurant, provides a lively route to the heart of the site. From the outset, Exemplar and Sheppard Robson worked with Publica to undertake a study of the public spaces and ground level activities of the neighbourhood. This study supported the design team’s masterplan that orientated the development’s commercial uses to the main street frontage, and conceived the courtyard as a tranquil counterpoint to the busy streets around. The heart of the project is accessed by three relatively narrow passages, balancing permeability with a sense of containment. The configuration of the residential buildings defines two overlapping squares, the larger formally framing the chapel. The chapel and the green space around it are placed on a podium further reinforcing its prominence, with the architects working with Gross Max to develop a detailed landscape design. Linked to this central space is a second smaller green square towards the north-east corner of the site, with a more intimate, secluded landscaped area with seating to make the most of afternoon sun. Its soft landscape contains medicinal plants relating to the previous hospital which existed on the site since the 18th Century. 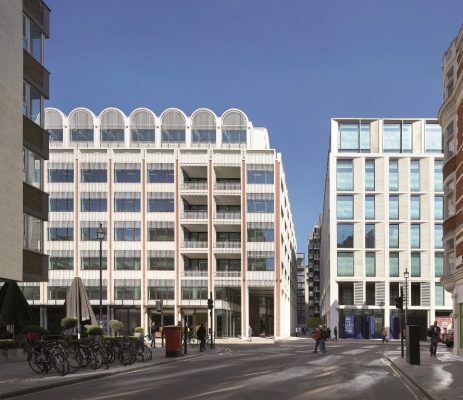 One Fitzroy Place – Estée Lauder’s new headquarters – is the larger of the two office buildings with 14,000 sq ft NIA of space set around an atrium, with shops at ground floor along Mortimer Street and Cleveland Street. The main façade of the building is composed of a regular array of elegantly proportioned vertical floor-to ceiling windows, while the solid panels are infilled with Portland ‘roach’ stone and finer-grain, long format blue/red bricks to the flank elevations. The splayed infill panels sit within a carefully crafted precast Portland-stone frame, adding depth and orientation so the building is perceived differently in oblique views depending on the direction of approach. Sheppard Robson devoted considerable attention to tuning the building to the demands of the modern working environment. The office floors are organised around a nine-storey atrium with the core logically located back-to-back with the adjoining residential block. Natural light is therefore evenly distributed, while the 9×12-metre grid – with perimeter spans of up to 13 metres – ensures uninterrupted flexible workspace. The design moves away from the sterile, anodyne character of many ‘spec’ office spaces and an architectural continuity is developed between the interior and exterior. The refined brickwork of the facade is also used to clad the main core – contrasting with frosted glass decks to the lift lobbies. Designed by Lifschutz Davidson Sandilands, the exterior language of Two Fitzroy Place is a bold, clear and original riff on the character of Fitzrovia. 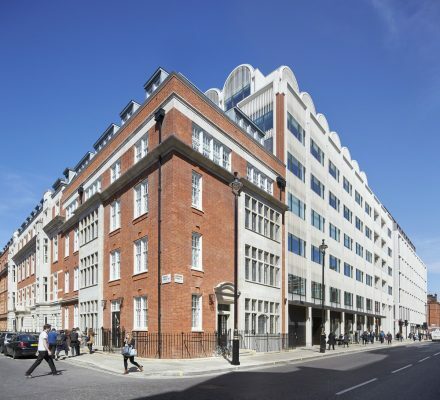 As with all the other buildings in the development, Two Fitzroy Place has an articulated base, middle and top storey and is divided into clear vertical bays relating to buildings in the neighbourhood. These architectural devices provide proportion and human scale. 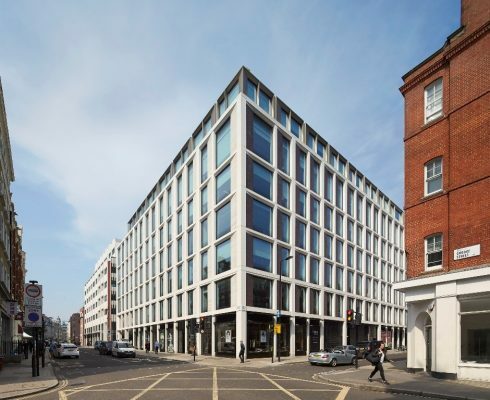 The materials of its structural frame – precast concrete pilasters with inset red brick – are influenced by the elevation of 10 Mortimer Street, the handsome Grade ll listed brick and stone building adjacent to its south-west corner. The architecture of the chapel was the inspiration for the distinctive vaulted roof that crowns the building and is visible from around the surrounding district. Vertical fins provide sun shading and privacy; the building has a dynamic quality, altering in transparency as one moves along its facades. Crucially, the entire ground-floor perimeter of Two Fitzroy Place is animated by public facing activities. The office reception, a large restaurant, the chapel and courtyard give the building a bustling base that adds much to the existing vitality of Fitzrovia. Inspiration for the three blocks of residential buildings also comes from the rich mix of the surrounding streetscape and the design strategy for dealing with the external form and section of these buildings expresses the accommodation internally. The buildings’ elevations around the perimeter are characterised by robust brick and steel detailing. The elevations that face onto the public space are made up of a lighter palette of glass and stone, addressing the inner courtyard. All apartments are tenure blind and their façades are articulated into a base of two storeys (plus the lower ground floor in the light well) a middle section of four to five storeys and a varied and generally setback roofscape of two storeys. The elevations are subdivided into bays of apartments, generally of three to four windows; only on the top floors where the bay structure breaks down do apartments cross over and occupy more than one bay. The contrasting material and treatment of the bays, and their stepping forwards and backward by small amounts creates a vertical rhythm in the street. One bay of apartments, on the central courtyard side facing the entrance from Mortimer Street, rises above the general elevation to mark the axis. Around the perimeter of the site, these three residential buildings thoughtfully contribute to the streetscape, with the inward-facing elevations designed to make the most of the tranquil new public spaces. Their plan forms result from the careful composition of generous well-laid-out apartments, predominantly dual aspect, optimising light and views while maintaining privacy for the occupants. The retained facade and configuration of the project’s various blocks created the opportunity for the architects to work with Johnson Naylor to create a rich mix of apartment types that resonated with the marketplace. Integral to the development is the inclusion of a number of community facilities. 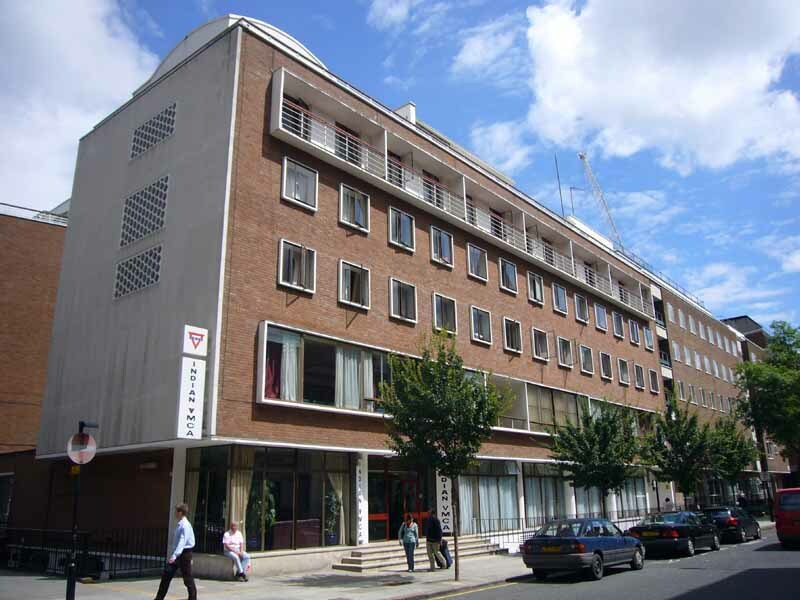 Providing a direct link back to the Middlesex Hospital, a primary care facility is entered on the eastern flank of the ground floor and extends to the lower ground level of the building on Cleveland Street. There is also education space in the form of an assembly hall for the adjacent All Souls School, entered from the northern frontage of the building.